This blog has only been around for about six months. I should have been writing it a long time ago, but somehow never did. The blog was born in connection with what I then assumed to be a larger project: a book focused on Portland's craft beer culture. The concept behind the book was to provide a reference for casual beer fans. My rationale was simple: A lot of people who go out beer tasting in Portland, whether they come from far away or live in the city, need a guide that provides more than just a list of breweries and where they are. I ran into lots of people who needed something like this while I was working on the book. My little book is not War and Peace. It would come in at somewhere around 100 pages in print. It features a brief history of the Oregon beer industry and how craft brewing started here. It then explores most of the brewpubs and pubs in the city, broken down by quadrant. Maps and photos are included. There are no formal beer reviews, beyond a general mention of what the destinations typically have on tap. Beervana Rising can be purchased through the various online vendors, including Amazon and Apple iBooks. The price is right: $4.99. The eBook concept fits in with the idea that people who buy the book can take it with them on their phone, eReader, laptop or tablet computer while pub hopping. Pretty cool! They say ePublishing is the wave of the present and future. I suspect it is. 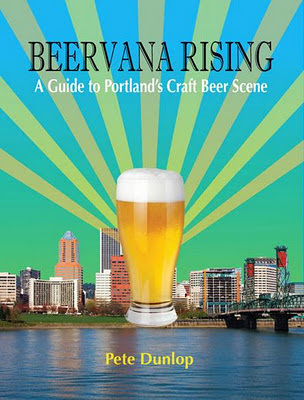 But I also recognize the importance of getting a get a print version of Beervana Rising out there. That may coincide with a second edition or I may get it done sooner. We'll see. For now, the digital version is out there. It's a great value. If you have an iPad or iPhone, I recommend making the most of your reading experience by buying the book through iBooks. You can certainly read it using the Kindle app, but the experience is richer from the iBooks app. The price is the same.